Cosmo tubus: "The new improved COSMO is our top of the line stainless steel rear carrier. It now comes with wider and longer top space and protected rear light position! 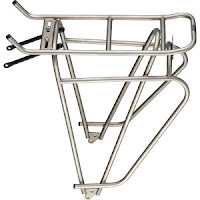 The back hooks of panniers are secured against sliding. The new COSMO has a maximum load of 40 kilos."